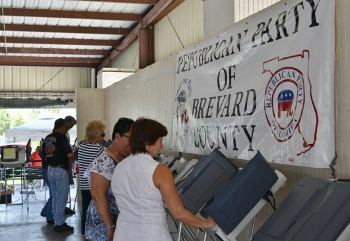 MELBOURNE, Florida – Brevard Property Appraiser candidate Dana Blickley beat opponents Jason Steele and incumbent Jim Ford with 62% of the vote in a straw poll of nearly 1,000 Republican faithful Saturday afternoon at the Brevard Republican Executive Committee picnic at the Wickham Park pavilion. Steele garnered 26% and Ford only 12%. Ford did not attend the event. Scott Ellis beat incumbent Mitch Needelman in the Clerk of Courts polling by a 72%-21% margin. Needelman also chose not to participate, according to BREC Chairman Barbara Davis. For Brevard County Sheriff, Wayne Ivey topped Todd Maddox 54% - 46%. In a three-way contest for the newly-drawn Florida House of Representatives District 53, Tres Holton carried 37.5% of the 592 ballots cast; with incumbent John Tobia coming in second at 34% and Laureen Trent at 28.5% rounding the total. In the three-way race for Brevard County Commission District 3, incumbent Trudie Infantini won with 41% of the straw poll vote. Former two-time commissioner Helen Voltz came in a close second with 35% and Jason Mahaney, the vice-mayor of Grant-Valkaria, had 24%. The straw poll was conducted by Supervisor of Elections Lori Scott and her staff, who said that 868 people cast votes. The picnic featured free hamburgers and hot dogs and many of the campaigns provided other refreshments. Taraneh Dugas, the Republican Party of Florida Brevard County Field Director for Mitt Romney, sang the national anthem. Among the other candidates in attendance were US Senate candidate and former congressman from Brevard County Dave Weldon as well as incumbent US Representative Bill Posey. Complete straw poll results for all the races can be found here.